Microchipping is something which has steadily been growing ever more popular among owners, particularly as over the years, animals have become so much more than just pets. They are now family members providing valuable companionship for many and it can be extremely traumatic should a beloved pet be stolen. Julian Peters, owner of the South East based Arthur Lodge Veterinary Group, has seen a number of cases of lost animals: "A missing pet, whether it be lost or stolen, is a heart-breaking ordeal for anybody. It is a stressful time for everybody involved not to mention extremely worrying. However, there are measures which can be taken to keep your pets safe." Microchipping is one of these measures. It is a reliable and cost effective way of keeping track of your furry, feathery and even fishy friends. That’s right - fishy! Most people will typically think of more traditional domestic pets such as cats and dogs when it comes to microchipping, however, microchipping is expanding to other more unusual animals, such as Koi. Some Koi can be worth £10,000 or even more, which makes them a top target for light-fingered pond pickers. 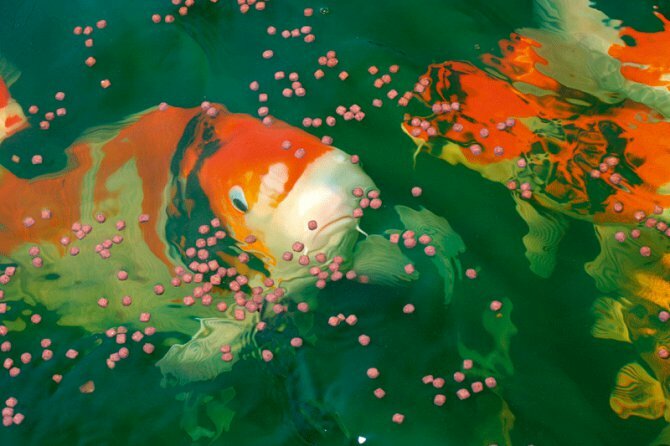 Fish burglary is fast becoming an increasing problem, with many recent reports of Koi being stolen from garden ponds. Koi enthusiasts invest a lot of time and money into their fish as Tony Barns can confirm: "I started to take an interest in fish a few years ago. Over time, I got more involved in my hobby, taking it progressively more seriously. As I began to collect more carp, I realised that I would need some form of protection for my stock, namely against theft." Microchipping lasts the lifespan of the fish, making it an extremely worthwhile procedure. What’s more, it is simple and pain-free. A tiny device, the size of a grain of rice, is inserted just beneath the skin via an injection. The chip contains information about the owner and once the fish has been chipped, the owner must register their contact details with a microchipping agency, such as PetLog. These details are subsequently added to the database. Fish can be identified with 100% accuracy if fitted with a microchip. The small chip contains information about the owner and can be accessed by a scanner being placed over the fish. Julian Peters continues: "It is true that fish smuggling is a growing phenomenon and with Koi rising in value, microchipping fish is definitely something that I would recommend to owners. I don’t know of any negative repercussions to microchipping fish. Technology is truly on our side in this case, especially as it is impossible for an amateur to remove the chip." Not only does microchipping protect against theft, it can also be used to monitor growth and health in fish as it can be quite hard to keep track of individual fish. This has been a real help for Tony as he explains: "As the fish can be so expensive in the first place, it is important for the owner to feel as though they are developing well. Being able to monitor them gives me that little bit of extra reassurance that everything is going to plan. I would definitely recommend microchipping to any other fish enthusiasts. For something that costs very little, it certainly brings a number of benefits." Julian Peters agrees: "The chips have proven to be a great help to aid in effective fisheries management, monitoring growth and condition which is extremely important with all types and breed of animals." Yet another potential advantage of microchipping arises when making an initial purchase. One thing that is important for people new to this hobby to bear in mind is that it is possible that some Koi are on the market illegally. Once the buyer has selected the fish, it is advisable to run a scan on them to ensure that they are from a legitimate source. As Julian explains: "Buying any animal is a huge commitment and this is especially true for Koi, particularly when you take into account the amount of money that is involved when purchasing some. As such, it is important for the buyer to be absolutely certain that they know everything about the animal before making the final decision. "The worst case scenario would be to part with all of that money only to find out that you need to return the animal to its rightful owner. Not only do you lose an awful lot of cash, you also end up feeling like you’ve done something wrong. A simple scan for a microchip can solve all of those worries." Microchipping fish is certainly on the rise and it is clear to see why. If you have fish and are interested in exploring this possibility further, it is best to contact your local veterinary surgery for further advice and to find out where the nearest marine microchipping service is available. Julian concludes: "I can see absolutely no reason why owners would not pursue this option. It is better to be safe than sorry. If more people seek to microchip their fish, we may be able to halt the rise in theft before it spirals out of control." Nathan Hill and Jeremy Gay use a Gordon Low box welded liner to set up a step-by-step pond for a PFK colleague. We’d had a pond 'itch' ever since the first sun of the year finally appeared and have been trying to find good reason to spend a day less desk-bound. We wanted to get dirty fingernails and re-acquaint ourselves with the cold caress of water-soaked sleeves — so we treated our editorial assistant Nicki to a pond installation! A reconnaissance revealed the perfect spot: a raised bed of bricks wasted with soil and a handful of plants. It was an ideal location in a south-west facing garden. The spot was close to the house and water supplies and it already had electrical connections put in to supply Nicki’s water feature. All it needed was a liner, water, a filter and some plants. Nicki got to task digging out the hole while we tracked down a liner — and this was the perfect opportunity to put one of Gordon Low’s box-welded liners into action as we’d been dying to do so for a while. The hole had been measured at 155 x 75cm/60 x 30”, so we just had to decide on a depth to suit. We established that 45cm/18” would be a good compromise, giving us a water volume of 500 l/110 gal, but not making the pond so deep as to be unmanageable. Box welds are superb for anyone with an awkward shape to fill and companies like Gordon Low can make them to order. Given the 90° angles and sheer sides of our pond, we were adamant that we would avoid unsightly creases and folds, as well as not wasting too much liner. After all, a formal pond requires formal lines. We opted for one of Blagdon’s all-in-one pond filters to avoid the sight of monolithic boxes around the edge of the pond, as well as for ease of use. This choice was fine by Nicki who tells us that the all-in-one is "a piece of cake to work with and easier to clean than my aquarium filter." Several weeks on and Nicki loves the result. Her maintenance regime is frequent but light. Rather than letting muck build up she cleans the filter weekly, using pond water to clean the foams. Planted up and housing three Sarasa comets and a canary yellow goldfish, Nicki is happy. The plants are bedding in and the fish have settled well, fast becoming bold enough to hand feed, despite the presence of cats and dogs! The only potential setback was remedied early. Blanketweed appeared within the first two weeks, clinging tenaciously to the liner. Nicki removed it by hand and added some more plants. Since then it’s been algae-free! 1. The hole inside the 155 x 75cm brick bed was dug down, removing any fragments of sharp stone or glass on the way. A few worms were unearthed and rehomed as we found them! 2. After measuring out the underlay on the lawn it was folded to shape and used to line the pond. We deliberately used a little too much and opted to trim back any excess as needed. 3. The box-welded liner was measured on the lawn and checked over for any signs of tearing or punctures. The last thing we wanted was to install the pond and only then find a leak! 4. The liner was placed into the hole and the arduous task of lining up the edges began. With a custom-cut liner it’s important to make sure that all edges are flush to avoid stretching. 5. The liner was being continually worked into shape as the pond was slowly filled with water. This way any shifts in the supporting soil can be accounted for and any weak spots noted. 6. As we wanted to fill the pond with plants on the same day as installation it was necessary to use a dechlorinator. It’s good practice to use these chemicals early on when changing water. 7. 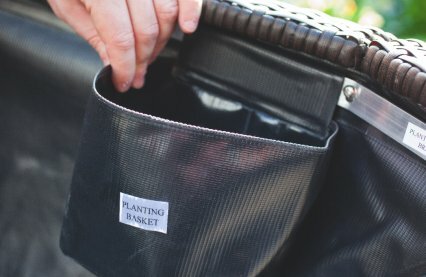 We took Nicki plant shopping, and picked up an Equisetum, Caltha, Lobelia and Juncus marginal plants, as well as a pygmy lily and some oxygenators — plants we felt would provide just the right mix. 8. The plants were then repotted to allow for growth, using larger baskets with hessian liners. The plants were then added, along with extra soil, and the pots topped off with gravel to trap it all in. 9. The liner and underlay were trimmed into shape once we had the weight of the plants holding the corners in place. The edges were later sealed in place using Hutton Aquatic Supplies Gold Label pond sealer. 10. The lily was then repotted and added to the pond, along with the bunched oxygenators. Although some people like to pot oxygenators we chose to let ours float loose for this particular project. 11. The plug was connected to the pump/UV and the unit added. Given the narrow nature of the pond we opted to use a bell fountain which tends to lose less water to wind than a rose type. 12. Several weeks on and plants and fish have been added. The pond has been sealed at the edge, keeping the liner in place. Water was tested before each fish addition to check for ammonia and nitrite. How much would this pond cost you? The liner, here supplied by Gordon Low has a retail value of somewhere about £172. The retail price of the Blagdon all in one filter works out at £99, and the plants and fish reach a combined value of around £90 - but buying smaller plants and fish would reduce this. You may be shocked to find that the most prominent invasive aquatic species in the UK are perhaps the most common "oxygenating" plants found in the industry. Joe Augier looks at the impacts some of our popular aquatic plants can have on the environment. So the title may seem a bit Hollywood and over the top, but there is a serious side to this article. I have been a fishkeeper since I was a child, I went to Sparsholt College to study aquatics; I've have kept a vast array of different aquariums over the years and have worked in numerous aquatics shops around the country. It's only since I have given up the aquatic retail trade and started to study a degree in ecology that I have learnt the true impact that the hobby has on our environment. It all came to me when I joined a volunteer group at the college I attend called SINNG or Student Invasive Non Native Group. The aim of this voluntary group is for students to go to places that have been impacted by invasive non-native species and survey the damage done by these species, and if possible reverse this damage. Invasive species cost our economy approximately £1.7 billion per year to deal with and thanks to the work of local action groups around the country like SINNG, and acting according to Defra’s best practices, it is hoped that not only will it benefit the environment but also the economy. In fact whilst writing this article there has been some remarkable headway in the control on invasive aquatic species. The government has announced that five species of non-native invasive aquatic plant have been banned from sale in the UK, including one of the stars of this article - Parrot's feather (pictured above). As of April 2014 retailers will no longer be allowed to sell these plants and failure to comply will result in fines up to £5000 and a possible six months in prison. My first trip out with SINNG took me to Penrose Water Gardens near Truro, Cornwall to map and remove invasive aquatic plants in the garden’s numerous ponds. Penrose Water Gardens have been actively involved in the SINNG project and have been promoting the use of native pond plants for some time, but even with the help of SINNG it has proved hard to eradicate invasive non-native plants completely. When we arrived there we mapped the area and started to assess the level of infestation and after mapping the first pond it occurred to me: "I am responsible for this". You see the plants we were identifying and aiming to remove were aquarium and pond plants - plants that I sold to people. Plants that I was not aware had the impact that they do on our native waterways. It was at this point that I made a promise to myself, to try and raise awareness of these problem species and if not eliminate them from the industry then at least give you, the consumers, the knowledge that I should have been giving you all those years ago about how to correctly identify and dispose of these pest species. 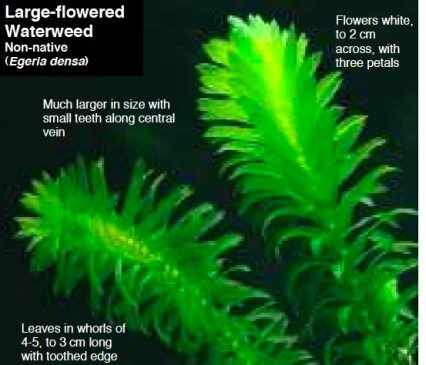 The most prominent invasive species are perhaps the most common "oxygenating" plants found in the industry, Parrot's feather (Myriophyllum aquaticum) and "Elodea" species (Elodea canadensis, Elodea nuttalli). The problem that arises with these species is the confusion in correctly identifying them. Elodea has become something of a blanket term for oxygenators as there are very similar species that are easily confused, which leads us to the problem of which ones are safe? Native species like Potamogeton and Callitriches are not only safe, but are great oxygenators that would not cause problems if they were to enter our native waters. 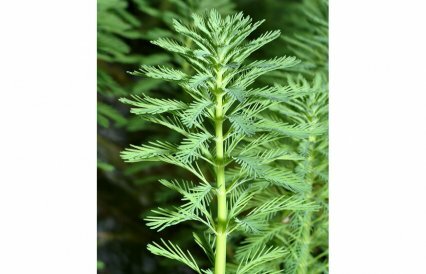 But be sure to avoid plants such as Lagarosiphon major and Egeria densa; in my experience these are what you will commonly find being sold for coldwater aquariums as well as ponds. Parrot's feather too has some very similar counterparts that are far better alternatives to this prolific growing plant, plants such as Hornwort (Ceratophyllum demersum) pictured above, Mares tail (Hippuris vulgaris) or Eurasian watermilfoil (Myriophyllum spicatum). So now let's talk about identification! The information on the species below is provided by kind permission of Defra. Emergent growth, blue-green colour and feather-like leaves make this a distinctive water plant. Present year round. Unlikely to be found in fast flowing water. Aquatic perennial, grows in emergent and submerged form. Both forms are similar in appearance. Most often found in nutrient rich waters. Grown in water gardens in UK since 1878, first recorded in the wild in 1960. Initial spread by improper disposal of garden and aquarium plants. Still found in some garden centres, often under one of its pseudonyms. Spreads by vegetative fragmentation, no seeds are produced in the UK. Causes flooding by blocking watercourses and drainage channels. Can rapidly dominate a water body displacing native species. Parrot’s feather is listed under Schedule 9 to the Wildlife and Countryside Act 1981 with respect to England, Wales and Scotland. As such, it is an offence to plant or otherwise allow this species to grow in the wild. For details of legislation click here. Emergent leaves are stiff, bright green and the most distinctive form. Submerged leaves are more fragile and, after death, decompose quickly. Dies down in winter, can be found submerged throughout the year. Emergent shoots appear in spring when the plant becomes moreconspicuous. Blue-green colour of leaves is useful for identification. Flowers are present from May to August, but are inconspicuous. The emergent stems of Parrot’s feather distinguish it from native Water-milfoil species: Spiked water-milfoil (Myriophyllum spicatum) Alternate water-milfoil (Myriophyllum alterniflorum) and Whorled water-milfoil (Myriophyllum verticillatum) which are never emergent, although the native species can produce short emergent flower spikes. 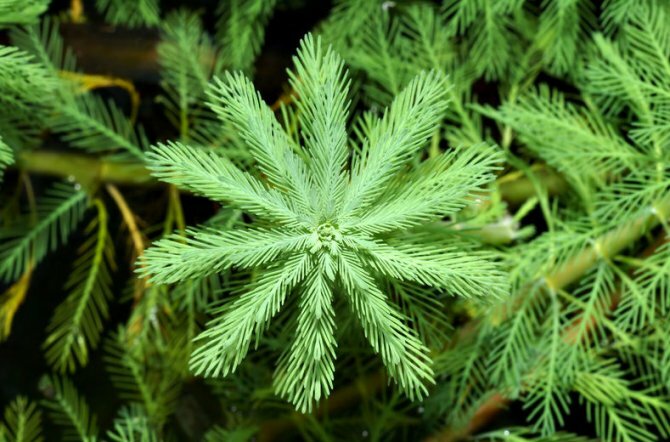 Parrot’s feather is also rarely, if ever, found in fast flowing water, unlike some native water-milfoil species. Submerged Parrot’s feather is difficult to distinguish from these species and expert assistance may be required. There are two non-native species of Elodea in the UK, Canadian waterweed Elodea canadensis and Nuttall’s waterweed Elodea nuttallii. 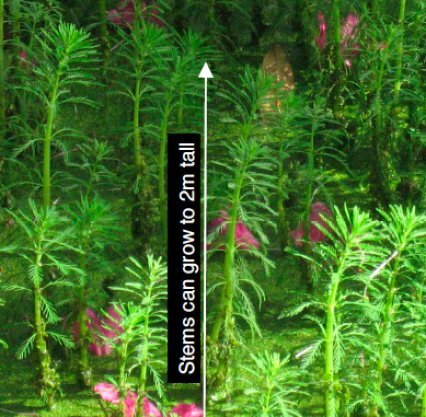 Both are aquatic, submerged (apart from tiny white flowers borne on very long threadlike stalks just above the water surface) growing up to 3m in length, perennial and only reproduce vegetatively in the UK as all plants are female. Nuttall’s waterweed is found in more nutrient-rich water than Canadian waterweed. First recorded as naturalised in Britain in 1966, it has since spread rapidly but is less common than Canadian waterweed in northern England, Scotland and Ireland. Dense growth of these waterweeds in slow flowing rivers, drainage channels and canals can impede flow and exacerbate flooding. They replace native aquatic plant species and reduce biodiversity in lakes and ponds and interfere with recreational activities such as angling and boating. Elodea species are listed under Schedule 9 to the Wildlife and Countryside Act 1981 with respect to England and Wales. As such, it is an offence to plant or otherwise allow these species to grow in the wild. Canadian waterweed and Nuttall’s waterweed are both perennial and are present throughout the year, though they can die back in winter. Tiny flowers are produced June to September. Canadian waterweed is widespread and common throughout the UK. Nuttall’s waterweed occurs mainly in England. In Lagarosiphon major the lower leaves are spiralled at base, not in whorls; leaves to 3cm long. Flowers inconspicuous, with reddish petals. You can download ID sheets on these and other invasive species on the Defra website. It is important that these species can be correctly identified so as to be able to avoid them in the future and perhaps more importantly, if you already have these species in your pond that you know how to dispose of them properly! You see, one of the reasons why these plants so successfully invade and colonise new areas is that they are so robust. Something as simple as a bird landing in your pond and getting a tiny fragment of Parrots feather stuck to it has the potential to travel to another body of water and totally devastate the natural ecology of the new area it has invaded. The same applies if you throw your excess plants down the drain, it will almost certainly take root somewhere further down the line. 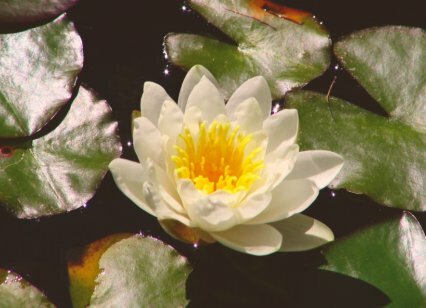 In order to ensure that these plants don't contaminate any further places the safest thing is to remove as much from the pond as you can, leave it by the pond for 24 hours so all the bugs and critters can crawl back in, and then compost it (your garden plants will love it). For further information about invasive non-native species visit the Defra website. How to build a pond in less than one hour! Jeremy Gay creates a kit pond that represents the essence of sunny days and total relaxation. Follow his step-by-step guide to setting one up in under an hour! Summer time always makes me think of ponds, water gardening — and barbeques of course — and you can’t beat being outside in the sun watching and listening to moving water. So when Blagdon launched its new Affinity range of feature pools we liked them so much that we set one up. Mention the words water feature and we all think back to the days of Ground Force with Charlie Dimmock on TV, featuring the ubiquitous pebble pool in almost every programme. Judging by what’s emerged from Blagdon, water features have come a long way since then. These new pools look good, are made from quality materials and, importantly for the PFK reader, you can sensibly keep fish in them. The problem with keeping a few token goldfish in most sinks or half barrels is that they are too small and won’t really provide an adequate home over winter. Blagdon says the new Affinity Octagon model we set up holds nearly 500 l/110 gal of water. That’s easily enough to house goldfish and goldfish varieties long term, and, what’s more, it comes with a quality pump with loads of mechanical and biological filter media to boot. This pool definitely earned our full attention! It’s only when you actually set the thing up that you realise that even more design and technology has gone into it. There are adjustable feet, construction is sturdy and it looks good. When he isn’t photographing fish Neil Hepworth is taking shots of award-winning gardens at Chelsea for the Royal Horticultural Society and he and I were both eyeing up this pool as a potential purchase for our gardens, to position between our Hosta, bamboos and tree ferns. Setting up any outdoor pond or water feature is normally a lengthy chore, yet this one was done, from start to finish, in around one hour — and that includes getting everything photographed too. There was no digging, so no backache. Hallelujah! It was so very easy to assemble — and involved no guesswork either. 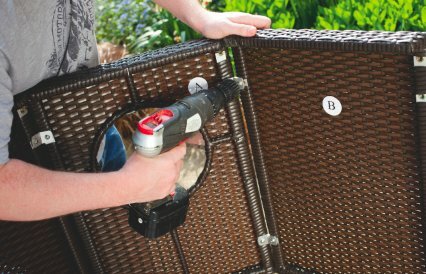 These instructions just told me to “assemble panels A and B…place liner inside…fill.” I didn’t even break into a sweat and had the rest of the sunny day to admire my great new creation. So what’s the catch? Genuinely, there isn’t one. I was a bit dubious about the windows at first, yet once set up you get a view of your pond and its wildlife that you wouldn’t otherwise have, so I liked that too. Happy days! 1. Everything you’ll need comes included – even a screwdriver. Just add water and any livestock that you want to include. Lay all the bits out so you can familiarise yourself with what goes where. 2. Pre-cut underlay goes down first, helping to protect the liner from sharp objects underneath, although this liner is tough anyway. Choose a flat area of the garden with access to power point and lay it down. 3. Being octagonal this pool comes with eight connectable panels. Screws and brackets are provided, so just fix panel A to B to A and so on. There are three panels with windows to position near the front. 4. One of the best features must be the pre-cut, pre-shaped liner. No calculations, no folds, no off-cuts. Just put it in, fasten it to the panels and you’ve saved yourself hours. 5. The pump comes with filter, light, fountainheads and optional UVC upgrade. Assemble the fountain stem, adjusting the height. You’ll want the fountainhead to stand a few inches above the water. 6. Thread the power cable from the pump between liner and outer panels, feeding it out at the rear, at the bottom. The cable is easily long enough, but the Powersafe extension range is fully compatible. 8. Fill the pond with water from the hosepipe. 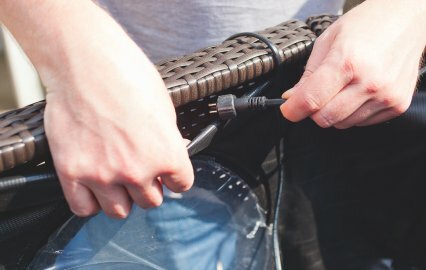 It only takes about ten minutes on average to complete the job and by using a hose you will save yourself any unnecessary backache. Dechlorinate with the bottle of Blagdon Bioactive TapSafe supplied with the kit. This will neutralise any chlorine or chloramine in the tapwater, making it perfectly safe for your fish and visiting wildlife. 9. I’ve chosen the adjustable bell jet fountainhead. After filling check the pump is working and adjust the size and shape of the bell by twisting the top. Turn it off first so you don’t get wet! 10. The first plants go in. I spent £45 on a mix of oxygenators, marginal and deepwater plants. Bunched oxygenators can be dropped in and don’t need to be potted up. Lilies and marginal are next. 11. The volume of this water feature means that it is large enough to hold fish. I start by adding two small, hardy Common goldfish. Float the bag to equalise temperature and mature the filter first. There are two Affinity pools in the range — the Octagon and Half moon. RRPs on both are £399.99. I spent £45 on pond plants, a good £20 of which was on a nice water lily. Two Common goldfish or two Comets will set you back about £5. Plant heavily to avoid algae problems early on and you may want to invest a further £49.99 on the UVC upgrade if the pool is situated in full sun. Fill time: 20-30 minutes average, depending on hose/water pressure. Size: To more than 30cm/12” though usually smaller. Diet: Algae, soft leaved plants, insect larvae and aquatic invertebrates, but you can just feed them pond sticks, flakes and pellets. Pond size: As large as possible, with 500 l/110 gal being minimum volume for year-round outdoor care. Sexing: Females become larger and fuller bodied with eggs. They can look lopsided from above too. Males are slimmer and develop white dots (tubercles) on their gill covers and white ridges (breeding stars) on their pectoral fins. Breeding: Males chase females into shallow water and soft leaved plants, where they release eggs and sperm. Fry need to be fed newly hatched brineshrimp, or be left to their own devices in a mature pond. Pond mates: Other goldfish varieties such as Comets and Shubunkins, and they will interbreed. Size: Up to 10cm/4” for males, but normally around half that. Diet: Aquatic invertebrates, insects and, if you’re lucky, dry foods. Pond size: About 150 l/ 33 gal upwards. Sexing: Males become blue with a red breast and blue or green eyes. Females become fuller bodied with eggs. Breeding: Fascinating breeding behaviour whereby the male becomes very colourful, territorial and builds a nest. The female is enticed into the nest where they spawn. The male then guards the young. Pond mates: Best kept on its own and not with goldfish or any ornamental varieties. 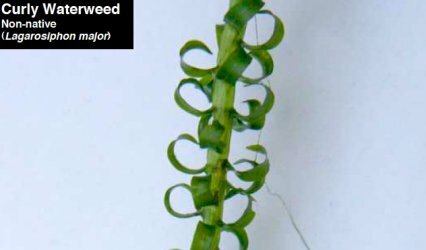 Name: Elodea, Lagarosiphon and Egeria, curly pond weed, oxygenating plants. Size: Starting as bunches of single cut stems they can grow several feet in length and usually form a large clump. Care: Oxygenators need clear, filtered water to take advantage of bright sunlight. Lots of oxygenators help prevent algae and aid water quality, though too many do the reverse at night and consume oxygen. Keep half of the pond surface free of these at all times. Feeding: Oxygenating plants can grow so quickly they benefit from plant food added to the water. A liquid food can be added weekly. Pruning: Simply snap off the old, brown stem from the bottom up or use scissors. These hardy plants can be snipped and thrown back in. Planting area: Anywhere in water up to 90cm/3’ deep, either weighted down or free floating. Potting is not necessary. Size: From 50p-sized leaves and 30cm/12”spread, to more than a 180cm/72” spread with 30cm/12” diameter leaves. Care: Most have leaves around 15cm/6” diameter and a total spread of about 90cm/36”, though many can grow much larger. There are four flower colours – yellow, white, pink and red — and, depending on species, leaf shape, leaf colour, flower shape and colour also varies greatly. All lilies must be planted in large pots, with plenty of soil, and at depths from 30cm/12” to more than 120cm/48”, depending on species. Feeding: Water lilies are heavy root feeders, so use good quality aquatic soil and add fertiliser tablets. Use as large a pot as possible. Pruning: When old leaves turn brown they should be removed at the base of the leaf stem. Large root masses can be divided with a knife and potted up. Planting area: Usually in the deepest part of the pond, in the middle, and away from waterfalls and fountainheads. Size: Usually 60cm/24” across and 60cm deep. Care: Water hawthorn is classed as a deep water plant and should be treated the same way as a water lily. Pot it in a 2 l/3.5 pint pot and larger, in aquatic compost, and dress with lime-free gravel. Then plant 60cm/24” deep. Feeding: This will feed through roots, via the soil. Fertiliser tablets can be added to the soil, or the plant can be repotted in new soil. Pruning: This plant stays contained, although dead leaves should be removed at the base. Planting area: Usually placed in the deepest part of a pond or pool, so 60cm/24” depth is about right. Size: Up to about 30cm/12” across, but daughter plants will radiate outwards. Care: A tropical floating plant, this will only survive in British ponds in the hottest summers. Despite this it’s popular for pond displays. Just drop it onto the surface to provide shade and spawning opportunities for egg-scattering fish. Feeding: It takes nutrients through the floating roots, so a liquid fertiliser can be added directly to the water. Pruning: Daughter plants can be separated, or over time will separate themselves and float off. Size: To about 60cm/24” in height and spread. Care: This native marginal should be planted in a large basket, on a shelf, with water to the top of the pot. It can tolerate shade or full sun. Feeding: With leaves above the water line, just pot into a nutritious aquatic soil and occasionally offer fertiliser tablets. Pruning: Doesn’t need much pruning, so just cut back in winter if any leaves start to die off. Planting area: This should be placed on a shelf, in 15cm/6” of water. Jeremy Gay helps you tackle and overcome a true menace of the pond. Algicides — chemicals that kill the algae, like a herbicide — though these are merely short-term fixes that don’t address the initial cause of the algae. Chemical filter media like phosphate removers can help to prevent or starve green water by removing their food – the nutrients from the water. PFK has received many enquiries from readers experiencing green water. Every expert we associate with has recommended just leaving the problem to sort itself out, unless you want the more instant and prolonged results gained from using a UVC. Have you split off or manipulated the water flow in some way? These packages need all the rated flow to go through the filter in a cycle — not “teed” off so that some of the flow goes through an ornament. Is the pond situated in full sunlight? A badly placed, badly designed pond will be much more prone to algae problems. What is the fish load in the pond and how much are you feeding the fish?These clear water guarantees are based on averages and ten goldfish produce far less waste than ten Koi. From experience I always like to choose a system that will filter at least half the pond volume added again, or even twice the volume. This will seem like a waste of money at the time but buying a small system not up to the job is false economy. This article first appeared in the August 2009 issue of Practical Fishkeeping. It may not be reproduced without written permission. Itâ€™s mid-summer and, apart from algae growth, your pond will more than likely be looking great. However, it wonâ€™t stay that way without a bit of attention, says Jeremy Gay. A pond in this beautiful season is what many of us imagine as an idyllic scenario; clear water, luscious pond plants, active fish and lots of insect life. Your pond should be looking its best, the fish their most ravenous — and at last you can get to sit outside and appreciate the fruits of your earlier labours. Oxygen, or the lack of it, is the biggest risk to your fish in summer. On the plus side you have aquatic plants, pond pumps and maybe an air pump. Among the negatives are the reduced ability of warm water to hold oxygen, increasing demands of your fish, and the fact that aquatic plants actually demand oxygen at night instead of producing it. How do you know when your pond is short of oxygen? You may not know until too late when you look one morning after a hot, sticky night and some of your fish have gone belly up. If you find that fish have died overnight for no apparent reason, it is more than likely through lack of oxygen. What’s more, it will often just be the larger fish that go as they demand more of it. Another giveaway is when you just lose Golden orfe, as they are the most oxygen demanding of the pond fish commonly available. Aeration is the key to increasing oxygen levels and driving off harmful CO2. 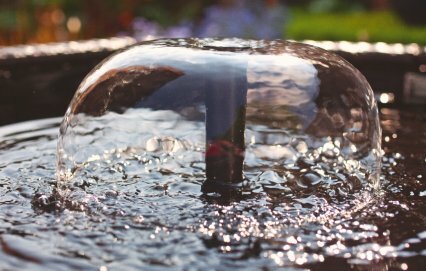 Pond water can be aerated by moving it with a pump — a fountain attachment or waterfall are best, though beware that turning these off at night often causes problems. Leave these fountains or waterfalls running 24/7 in hot weather. An air pump designed just for pond use is ideal. The reason why many people turn off fountains and waterfalls is not so much to save energy as to reduce noise at night. If so, consider a pond air pump and one or more large air stones as they will efficiently aerate at a noise level that won’t be audible. Aeration from air stones can also help with pond filtration. Filter bacteria are aerobic and the more oxygen you provide them with the more efficiently they do their job. Drop an air stone into a pond box filter and it may be able to cope with more waste. Pond plants are great, but you don’t want too many ‘oxygenating plants’ (pictured above) in the water because of the reversal of gases at night. Aim for surface coverage of about one third and only have more if accompanied by constant water movement or an air pump and air stone. If you have fish you should have a filter in all but the largest and most lightly stocked ponds. Summertime is when the filter is working hardest, especially if a pressurised filter and UV. The UV disrupts the green algal cells that cause green water and they get trapped in a fine sponge. In summer the filter is in overtime clearing green water, but that also means more waste being trapped in the media. Couple that with increased solid waste from increased fish feeding, larger fish as they grow and possible extra fish from spring breeding, and your filter will clog more quickly and need to be cleaned more frequently. As efficient and compact as they are, I prefer standard gravity type box filters to the pressurised canister types as they clog more slowly — and if they do become clogged, water bypasses easily. Leave a pressurised filter too long and, if it doesn’t come with a bypass as fitted, you lose flow. This means that you also lose oxygenation and filtration to your pond. I’ve seen many cases of people returning from summer holiday to find their pump and filter had stopped and their fish dead or dying. If you go away a lot and don’t want to maintain your filter on a daily basis in summertime, choose a box filter over a pressurised one. Warm sunlit water is most prone to algae growth and you will tend to get one of two types of algae, but never together. Green water is exactly how it sounds, with your pond water resembling pea soup. It is actually harmless and usually goes through boom and bust periods as nutrients accumulate, the green water blooming then crashing as the nutrients get used up. Natural control includes shading the surface of the pond with plants. A combination of aquatic, marginal, deep water and floating plants will not only reduce light streaming through the water but soak up the nutrients the algae needs to bloom. Another natural method is to add Daphnia, as these minute filter feeders consume green water and clear it. Swan mussels are said to clear it too, though they need perfect water conditions yet a constant food supply to filter out and consume, so good results are not gained by everyone. Daphnia are a great addition to natural, unfiltered ponds and make for great first foods for fish fry. Add it to green water, then fish fry, and you get a lovely little food chain as the Daphnia eat the algae cells and the fish fry eat the Daphnia. However, a clinical, filtered pond will remove Daphnia quickly, either by filtering it out, having a lack of microscopic food or simply from being over predated by fish. This is a fairly modern phenomenon, possibly more common now as phosphate levels increase in our mains tapwater. Basically the bane of the pond keeper is to clear the pond of green water with a UV, only to suffer from blanket weed growth in the crystal clear water. Again it feeds on nutrients, so excess algae growth means there are high levels of either phosphates or nitrates or both, coupled with too much sunlight. Ultra violet clarifiers (UVCs) are not effective on blanket weed as it grows on the sides of the pond instead of being waterborne and passes through the filter and UVC. Algae also produce oxygen and consume CO2, yet do the opposite at night. Too much algae is like having too many plants and they may strip oxygen levels. So, apart from looking unsightly, algae can also cause breathing problems for your fish. Furthermore, oxygenate heavily when using algae-killing liquids and powders as oxygen may be stripped from the water. Test the water, as if significant algae dies off it can foul the water. Previously, as unsightly as it was, it may have actually been benefiting the reduction of nutrients, not adding to it. I’m not talking protein skimming here, as this is more the domain of the top-end Koi ponds. This is surface skimming; a simple practice that can aid gaseous exchange, lighten mechanical and biological load and generally make your pond look nicer. Surface skimmers can be adapted filter inlets which draw water across the pond, scaling down to simple skimmer nets used regularly to remove floating debris by hand. The surface of a pond can build up with all sorts of rubbish in summertime: dead insects, pollen, foaming from use of algae treatments and proteins and oils from heavy feeding. Floating duckweed (pictured above) is a particular pain. 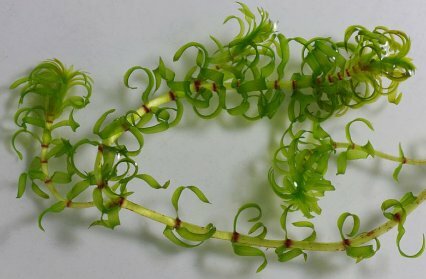 It is a tiny green plant that plagues some ponds, suffocating everything beneath it and becoming a real risk to oxygen levels. It’s a good nutrient filter but that is about it, and too much looks unsightly. Install a surface skimmer and all these problems go away, quickly and effectively. A clean surface free of debris goes back to that all-important element— oxygen — so by skimming the surface, keeping the water moving and keeping an eye on planting and algae you help to prevent a heatwave wipe-out. If your fish look to be suffering, the last thing to do is add food. This will add to the biological demands of the entire pond and cause the oxygen-consuming bacteria to take more of it. Fish will not eat if too hot, with uneaten food causing pollution — or they will eat, excreting more ammonia from their gills as they demand more oxygen. In short, in a heatwave, don’t feed. Try to shade the pond, keeping it cool long term. Floating ice or a massive water change aren’t brilliant ideas, as a sudden change to cooler water will often bring on whitespot through stress. If yet to dig your pond, site it away from full sunlight as this will cause a rise in temperature and nuisance algae. Dig it as deep as possible, as a deeper pond will stay cooler in summer and warmer in winter, yet will fluctuate much less. If you think of the shape of your pond in profile, try not to create a shallow, satellite dish as, although it will have a high surface area, this will also mean temperature fluctuations and lots of algae growth. This item was first published in the August 2009 issue of Practical Fishkeeping. It may not be reproduced without written permission.